Guided implant surgery uses the patient’s CT images to pre-plan implant surgery utilizing computer software and the fabrication of a surgical template. 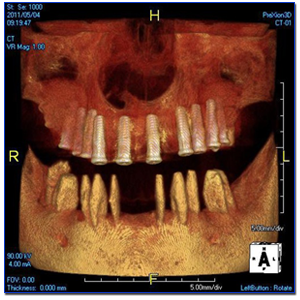 Conventional implant planning via panoramic x-ray images has its limitations, and precise placement with regards to the occlusion and restoration is often difficult. However, guided implant surgery can be executed quickly, accurately and is now economically feasible. Guided implant surgery is a paradigm shift that assists a large number of dentists to place implants with expertise and allows a greater number of patients access to this modality of treatment. It can also be a great adjunct in developing a thriving dental implant practice through greater success rates and patient referrals! – Accurate, safe, and predictable surgery. – Eliminates the need for sutures. – Smaller incisions with less bleeding and pain. – Immediate loading can be done. – GUESS WORK IS ELIMINATED!!! Most GPs have been reluctant to place implants due to the risk of injuring a nerve or impinging upon the floor of the sinus or nose. With PGS guided surgery, many of the risks are eliminated. The doctor is confident knowing the anatomy and any potential obstacles prior to the surgery by virtually placing the implant on the computer ahead of time. All angulation issues are taken care of before surgery, eliminating the changing of angulation during the surgery which adds additional stress to the procedure and ultimately whether the outcome is a success or failure. Because many of the cases with guided surgery can be done without a flap, implant placement can be performed in a lot less time. Since all the planning is done prior to the surgery, less time is exhausted by determining the direction and parallelism of the drill or if a bone graft is necessary ahead of time. Every nuance about the surgery is made prior to the surgery. With guided surgery, many cases can be done without a flap, removing the “wicking effect” of sutures. Cases in which a flap is required, the flap design can be more conservative. Many times the only reason to lay a flap would be to contour the bone. The elimination of a flap allows for faster healing, less post- op pain, a satisfied patient and REFERRALS!